But just so you know, it’s actually not the Charge of the Light Brigade. It’s the wrong cavalry (heavy brigade not light), and the wrong enemy (France not Russia), and even the wrong war (Napoleonic not Crimean). Above all, this Charge had the opposite outcome (it ended in victory). 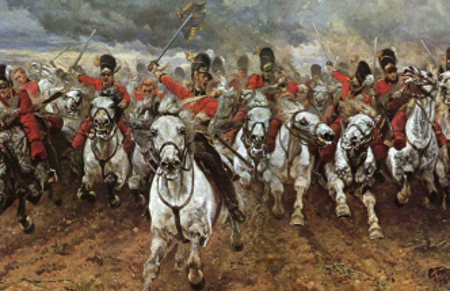 The original painting is Elizabeth Butler’s Charge of the Royal Scots Greys at Waterloo in 1815, known as “Scotland For Ever” – an event that took place nearly four decades before the catastrophic Light Brigade Charge at Balaclava (25th October 1854). Here are some more examples of Not-the-Charge-of-the-Light-Brigade. MANY THANKS to correspondents for their most interesting comments on what people may or may not know about the Charge of the Light Brigade, and what the Charge “means” today. I imagine very few people today have much of an idea of who/why/when/what the whole thing was about. But I may be wrong. Perhaps you could probe a bit. Do they know it chiefly as a poem or as a military event? Both? Do they know the poet’s name? Can they identify the war? And do they have a rough idea of when it took place? Of who was fighting whom, and with whom? Of other battles? Of famous participants? My own findings, admittedly based on a tiny and skewed sample (I don’t get out much), are not too encouraging. Even many university arts graduates don’t have much of clue, though there are some impressive exceptions. On the other hand, if you push and prompt a bit and you do get some light-bulb moments: Florence Nightingale, Mary Seacole, the pub at the corner that shares its name with Great Aunt Alma. That said, thanks largely to Tennyson (and a couple of blockbuster films), but also to countless small references in popular culture (which I try to keep some record of in the EJB Archive), the “Charge” looks like sticking around in the national consciousness for at least some time to come. Brexit – another Charge of the Light Brigade, with David Cameron as Lord Raglan? When I got up this morning, I firmly intended to write about what connects Light Brigade-historian Terry Brighton, the number of the Beast of the Apocalypse, the Heavy Metal band Iron Maiden, a pair of identical twin harpists, and a bottle of beer. But you’re going to have to wait for that one because I got distracted by, yes, the Referendum. In the last month or so I’ve noticed that “Charge of the Light Brigade” has been the metaphor-of-choice for describing the EU Referendum (so much more sophisticated than Turkeys voting for Christmas or Frying Pans and Fires).